Can it happen here? : Surrounded by the "Weapons of Influence"
Last fall, while I was working on an advocacy campaign, one of the guys who did media suggested that I read this book. "It will change how you think about everything," he insisted. To my surprise, he is right. 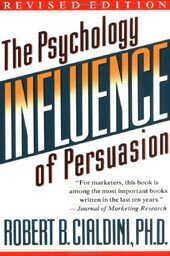 Cialdini outlines how human beings usually respond, without thought, to an array of triggers -- and provides many examples of how these triggers are used by marketers, con men and political advocates. He calls the triggers "weapons of influence." I am going to lay out Cialdini's thesis and make a few observations here. Then I want to dig more in subsequent posts into the political application of some of the "weapons" he describes. Influence is not a new book; the first edition came out in 1984, and it has been updated twice since. Because of its age, some examples feel slightly outdated. But thinking its argument is naïve would be a mistake. Cialdini, a professor of psychology at Arizona State University, took up the study of weapons of influence because he is a natural patsy. For as long as I can recall, I've been an easy mark for the pitches of peddlers, fund-raisers, and operators of one sort or another. True, only some of these people had dishonorable motives. The others -- representatives of certain charitable agencies, for instance -- have had the best of intentions. ...[T]his long-standing status as sucker accounts for my interest in compliance: just what are the factors that cause one person to say yes to another person? And so, like the good academic that he is, he did some research and created a matrix of categories to explain why we can be gulled into doing things we might not choose if we thought about it. He first explains both animals and humans do have automatic responses to triggering events or sounds that can seem pretty irrational. For example, a male robin defending its territory will attack an inanimate clump of robin-redbreast feathers. However, he will ignore a full-size, life-like, stuffed robin, if the breast feathers are replaced by ones that are not red. A very precise trigger is required to set off the behavior; and, if the trigger is present, the behavior follows, even though there is not even a facsimile of a bird. When we encounter a compliance trigger, we will probably do what we are conditioned to do without thinking about it. This is not a bad thing. We developed these triggers because they serve useful social functions. Mostly, they actually help us move through the day more smoothly than if we had to think about all our actions. You and I exist in an extraordinarily complicated stimulus environment, easily the most rapidly moving and complex that has ever existed on this planet. To deal with it, we need shortcuts. ... Without [shortcuts] we would stand frozen -- cataloging, appraising, and calibrating -- as the time for action sped by and away. Even the victims themselves tend to see their compliance as determined by the action of natural forces rather than by the designs of the person who profits from that compliance. So what are these triggers? Here is Cialdini's list as described on his website. Reciprocation. People are more willing to comply with requests (for favors, services, information, concessions, etc.) from those who have provided such things first. Commitment/Consistency. People are more willing to be moved in a particular direction if they see it as consistent with an existing commitment. Social Validation. People are more willing to take a recommended action if they see evidence that many others, especially similar others, are taking it. Scarcity. People find objects and opportunities more attractive to the degree that they are scarce, rare, or dwindling in availability. Liking/Friendship. People prefer to say yes to those they know and like. Potent stuff and we swim in an environment in which marketers and advocates deploy these triggers to move us everyday. I'll take up the specific triggers in future posts, but if Cialdini's description of their power is right, I think their pervasive deployment may provide an answer to the puzzle so well described by Robert Putnam: what caused the decline of community, of social capital, in U.S. life after 1960? Perhaps the multiple forces deploying of weapons of influence so pervaded our environment that people withdrew to maintain some feeling of control over themselves. Manipulative triggers use our own useful instincts to override our autonomy -- it may be healthy to try to insulate ourselves somewhat, even if that, too, can lead to irrational behavior, as when we abdicate political responsibility. This is pretty much obvious stuff that everyone knows. Common sense. Nothing more than that. You talk like everyone is exposed to these tricks like they have to buy this book to learn how to prevent them. People are smart, they comprehend more than just one word like "because" in a sentence. to the one who said people are smart and one word of "because" is unlikely to do damage .. how about the local firefighters fundraiser calling you at dinner time to ask you for support for their event? the person asking is not a firefighter, but asks you to support your local firefighters fundraiser. new dog old tricks ..